...a strange necessity has been laid upon me to devote my life to the central concern that transcends the walls that divide and would achieve in literal fact what is experienced as literal truth: human life is one and all men [and women] are members one of another. 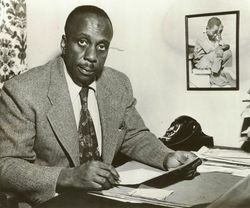 A sample from over 1000 talks and sermons available from the Howard Thurman and Sue Bailey Thurman Collections at Boston University. Click here for more. Each talk has a brief summary of its contents, thus offering an excellent way of learning about Thurman while hearing him. "The Church for the Fellowship of All Peoples is an interfaith, interracial, intercultural community of seekers dedicated to personal empowerment and social transformation through an ever deepening relationship with the Spirit of God in All Life. The Church for the Fellowship of All Peoples was founded in 1944 by Dr. Howard Thurman and Dr. Alfred Fisk as the nation’s first interracial interfaith congregation, and for over 70 years the church has helped people to discover God’s purpose for their lives." 1. Process: Life is a creative, unfinished, process. We human beings are creatures among creatures in the larger web of inter-becoming. Nature is creative and alive, fluid and open-ended. 2. Unity of Nature: The web of interbecoming is unified in that each entity depends on every other. Each being is unique but no entity is an island. 3. God is the Spirit of Life. : God is the Spirit of Life who dwells within each creature even as God also more than all creatures. God is closer to us than our own breathing. 4. The Need to Become Fully Alive: We are called by the indwelling Spirit to become fully alive relative to our contexts by surrender our will into the intimacy of the Spirit. 5. The Poor and Powerless: The Spirit has a moral valence: a special love for the poor, powerless, marginalized, and forsaken. The test of a healthy religion is how it helps people with "their backs to the wall." 6. Race and Context: It is not enough to address the timeless questions of human existence, divorced from local context. Questions of race and privilege cannot be avoided: "a man and his black skin must face the ‘timeless issues of the human spirit’ together." 7. Spirituality transcends Dogma: We need not and ought not make a god of institutional religions or of doctrines. Life and feeling have priority over institutions and doctrines. 8. Silence and Action: We find our life in God, not only in action in the world, but in the silence of the heart. 9. Commitment: From the silence, and also from our relations with others, we can creatively surrender our will to the promptings of the Spirit, moment by moment, and help heal a broken world. ​10. Empowerment: When we surrender our will to the Spirit, we do not lose our self-respect and integrity, we become even more self-respectful, even more creative, even more empowered, than we would otherwise be. We become fully alive, fully human. 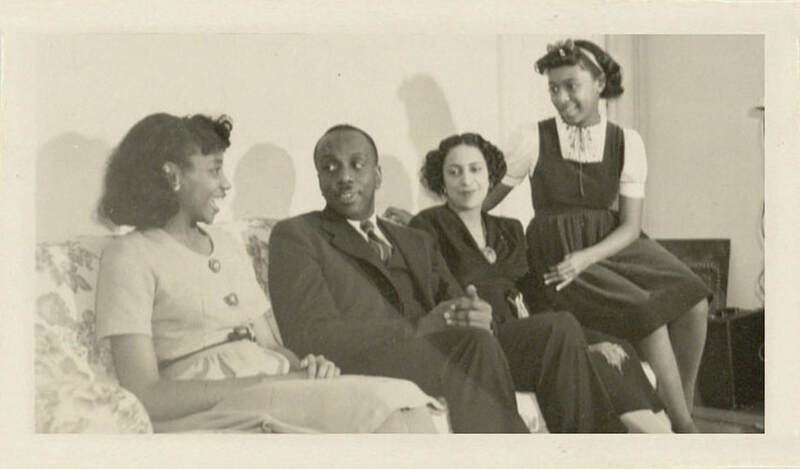 This is a page of Howard Thurman audios and videos. Author of 21 books and hundreds of sermons, he was a spiritual mentor for Martin Luther King, Jr. and many others. He is a guide for me, too, and others who are influenced by process theology. Thurman does not need a Whiteheadian metaphysic to ground his thought; he is quite fine on his own. The beauty of his perspective would be lost if it were reduced to abstract ideas in a Whiteheadian grid But for those of us drawn to Whitehead's perspective, we cannot help but hear a good bit of Whitehead in the talks he gives. The ten ideas above can easily be understood as Whiteheadian ideas even as they are Thurman ideas. He provides a vivid and vital illustration of what it might mean to live the process way. But not just for us. For all in the open horizons tradition: Christian open theists, generously orthodox Christians, ecumenical Buddhists, progressive Jews, humanistic Muslims. And, yes, those who are spiritually interested but not religiously affiliated. ​In a world filled with tragedy, many well-meaning people around the world feel a sense of urgency to act in constructive, life-nourishing ways. They critique oppressive social structures and work to build local communities that are creative, compassionate, inclusive, with no one left behind. They talk about the need for new stories that might help change the world, and they try to live out those stories in their daily lives. Howard Thurman reminds us that the religion of life transcends the religion of dogma, and that life is always in process, always becoming more than it was. The spiritual journey is a process of being open to an inner voice which is simultaneously a cosmic voice, whose name is Love and whose presence, within and between human beings, unfolds through contagion. We "catch" love the way we catch the measles. As a process theologian might put it, we experience love, first and foremost, by feeling loved by others through a "vector transmission of feeling." 2. What do you want to do, Really?